The BMWi range is definitely a head turner. The BMW i3 boasts sustainability, excellent handling and driving and impressive battery power. The high-voltage battery allows 0-80% charge at a quick-charging DC station in just 39 minutes resulting in a range of up to 124 miles. The model also features intelligent energy management allowing you to travel for longer. The model doesn’t follow any trend, it sets them. The BMW i3 features an eye-catching exterior design and balanced interior featuring sustainable materials and providing functionality for every passenger. Inside, the BMW i3 provides you with an abundance of luxurious features including a leather steering wheel with comfortable grip and a digital 5.7" TFT colour display instrument cluster behind the steering wheel. BMW and connectivity go hand in hand. The BMW i3 model is overflowing with technologic features such as numerous digital services and driver assistance systems. Furthermore, the infotainment system is easy to navigate, clear and informative with Media, Communication, ConnectedDrive, My Vehicle, Messaging and Navigation. BMW's i Navigation with range assistant keeps drivers aware of how far they can travel on their current charge and where the closest charging point is to the cars current location. The BMW i3 design is the definition of modernity sporting illuminated U-shaped LED headlights, kidney grill, an increased size diffuser-like rear bumper and a bold logo with BMWi blue highlights. The stream flow windows give the appearance of a single surface adding to the sleek and flawless presence of the BMW i3 and provide panoramic views out every window. The model features coach doors making loading safer and simpler and giving an overall feeling of spaciousness. The carbon fibre reinforced plastic (CFRP) roof reduces the car's mass and shifts the centre of gravity lower meaning the BMW i3 is more agile than ever. Personalise your BMW i3 to reflect your personality perfectly with an exceptional new colour pallet including Melbourne Red and Imperial Blue. Paired with the specially designed 19” and 20” light alloy wheels the BMW i3 will turn heads everywhere you travel. Exhilarating and outstanding performance is written within BMW’s DNA and the BMW i3 is no exception to the range. Thanks to the fully-electric drivetrain BMW eDrive, the BMW i3 has the ability to accelerate from 0 to 62mph in just 7.3 seconds all with zero emissions. The BMW i3 model has put sustainability at the core of its overall design. Incredibly, the BMW i3 is 95% recyclable as the battery module can be re-used as a storage receptacle for solar energy and the surplus carbon fibres can be returned to the production process. BMW are constantly striving to reach new heights when it comes to innovation, technology and battery performance. The popular BMW i3 model has a new partner in crime with a sportier edge –the BMW i3s. Agility, speed, and power are at the forefront of the BMW i3s’ overall design. Thanks to the engine’s maximum torque of 270Nm and 184hp (135kW) of power the model has the ability to reach thrilling speeds of 0 to 62mph in just 6.9 seconds all with zero emissions. The BMW i3s design primarily focuses on excellent performance. The model features refined aerodynamics and adaptive torque steering and has been designed to meet with demands from the sporty edge within you. Maximum performance and sporty driving dynamics can be activated with the touch of the SPORT driving mode button. Both the Automatic Stability Control (ASC) and Dynamic Traction Control (DCT) have improved to react quicker and provide more traction and stability when you need it most. 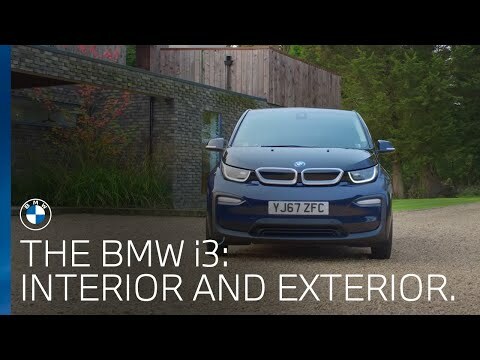 Not only does the BMW i3 perform like a sports model with tighter springs, dampers and a stabiliser on the front axle but the BMW i3 has been designed to reflect a sportier dynamic with a sportier lowered suspension. Inside, there are an abundance of eco-friendly materials including natural leather and eucalyptus wood. The BMW iDrive system has been updated to feature a 10.25-inch display with Navigation system. Throughout, there are particular hints of the BMW electric drivetrain such as optional blue seatbelts and a bold logo on the rear of the model with BMW i blue highlights as a reminder you can drive care free with zero emissions wherever you go.